Our ongoing series “My sqft” checks out the homes of 6sqft’s friends, family and fellow New Yorkers across all the boroughs. Our latest interior adventure brings us to the art-filled Greenwich Village loft of two art world professionals. Want to see your home featured here? Get in touch! When you step into this Greenwich Village loft, there’s a welcoming feeling of calm amid the unexpected combinations of Western and Asian art, historic and contemporary furniture, and traditional and eclectic objects. This can be attributed to the keen curation skills of the owners, who are affiliated with Chambers Fine Art, a New York- and Beijing-based gallery that specializes in contemporary Chinese art. For 10 years they’ve called this spacious apartment home, and 6sqft recently took a tour of the space and got the inside scoop on some of their most prized art pieces. Our ongoing series “My sqft” checks out the homes of 6sqft’s friends, family and fellow New Yorkers across all the boroughs. Our latest interior adventure brings us to the massive live/work space of a multi-disciplinary artist and designer in the Brooklyn Navy Yard. Want to see your home featured here? Get in touch! 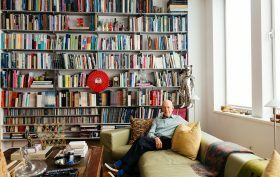 The artists lofts romanticized by Andy Warhol and Jackson Pollock are long gone in neighborhoods like the East Village and Soho, but if you turn your gaze across the East River to Brooklyn, you’ll find that these spaces are far less elusive; Just have a look at the home of multi-disciplinary artist Chad Lewine. Our ongoing series “My sqft” checks out the homes of 6sqft’s friends, family and fellow New Yorkers across all the boroughs. Our latest interior adventure brings us to a fitness studio COO’s Yorkville one-bedroom, infused with mid-century-modern furniture and contemporary decor. Want to see your home featured here? Get in touch! Ashley Davis moved to New York City after graduating from college in 2004. She thought it would just be for a couple years, but, like so many of us, she never left. She’s been living on the Upper East Side since 2007 and has been in her current Yorkville apartment for three-and-a-half years. After making a career shift from the advertising/tech world to joining her friend and former colleague Helaine Knapp at CITYROW (Ashley is the fitness studio’s chief operating officer), as well as very recently welcoming her boyfriend into her apartment, Ashley has created an inviting home that’s a mix of mid-century-modern furniture, contemporary decor, lots of textures, and a sophisticated color palette. Our ongoing series “My sqft” checks out the homes of 6sqft’s friends, family and fellow New Yorkers across all the boroughs. Our latest interior adventure brings us to fundraising professional/art lover’s cute Park Slope studio. Want to see your home featured here? Get in touch! When Lindsay Casale moved to Brooklyn seven years ago, she shacked up with roommates in North Williamsburg. But after finding success as a nonprofit professional working in fundraising–first for arts groups and museums and now at EL Education, a K-12 education reform organization–she decided it was time to have a space of her own. A self described “avid consumer of the arts, long-distance runner, and proud bookworm,” Lindsay relocated to North Park Slope for her first solo apartment, where she’s designed a creative home that perfectly toes the line between tranquil and bold, and artsy and refined, descriptors that also match her warm personality. Our ongoing series “My sqft” checks out the homes of 6sqft’s friends, family and fellow New Yorkers across all the boroughs. Our latest interior adventure brings us to a photographer’s Brooklyn Navy Yard loft. Want to see your home featured here? Get in touch! If you’re a regular reader of the New York Times, Forbes or the Observer, you’ve probably found yourself lingering over one of Sasha Maslov‘s photographs. Over the last few years, the Ukranian-born photographer has focused his lens on everyone from Mary Lousie Parker, Elvis Costello, and Ashley and Mary Kate Olsen to notable economist Joseph Stiglitz and real estate mogul Douglas Durst. While Sasha’s world appears to be all about capturing striking images of famous and fascinating people, his creativity extends well beyond the 2D format. 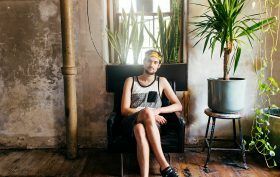 On the border of the Brooklyn Navy Yard is a 1,400-square-foot loft that’s been custom-outfitted from corner to corner by Sasha himself. A self-taught craftsman, his hallway closet hides a compact woodshop that’s allowed him to turn his once stark and wall-less apartment into a multi-room home filled with hidden storage and imaginative furniture. Sasha recently invited 6sqft to take a tour of his space, and let’s just say if he ever decides to quit photography, he’s definitely got a future in industrial design. Our ongoing series “My sqft” checks out the homes of 6sqft’s friends, family and fellow New Yorkers across all the boroughs. Our latest interior adventure brings us to two photographers’ Bedford-Stuyvesant brownstone apartment. Want to see your home featured here? Get in touch! As photographers, Michael DePasquale and Martina Maffini have traveled the world, shooting everything from India’s middle class to the last remaining Jewish cowboys in Argentina to the polished interiors of artists and designers across Europe. While this pair’s subjects are wide-ranging, their personal style is far more restrained. In their Bed-Stuy brownstone they let the building’s historic details define their space, complementing these features with the artwork of friends and personal relics. Have a look inside their home ahead, and be sure to pay special attention to one defining attribute: the shower in the kitchen. Our ongoing series “My sqft” checks out the homes of 6sqft’s friends, family and fellow New Yorkers across all the boroughs. 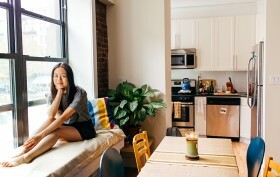 Our latest interior adventure brings us to Vanessa Lee’s lovely Hamilton Heights apartment. Want to see your home featured here? Get in touch! Like most New York newbies, Vanessa was looking for an affordable place to live when she arrived. This meant that living alone was out of the question, and living in a neighborhood like Soho or Tribeca would mean squeezing into an expensive sardine can with several others. 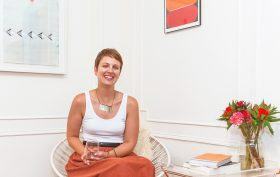 So rather than settling into any downtown address she could find, she turned her budgetary constraints into an opportunity for observation and discovery. Ahead she talks to 6sqft about her transition from London to NYC; why she chose out of the way Hamilton Heights; and how she’s now using food and video as a way to explore and share her adventures around the city with others. Our ongoing series “My sqft” checks out the homes of 6sqft’s friends, family and fellow New Yorkers across all the boroughs. Our latest interior adventure brings us to Summer Rayne Oakes’ plant-filled Williamsburg loft. Want to see your home featured here? Get in touch! As far as multi-hyphenate models go, Summer Rayne Oakes may be the most impressive we’ve come across. More than being a cover beauty, Summer is also a writer, businesswoman, activist, chef (she’s working on her first cookbook), and an ecologist by training (she graduated from Cornell with degrees in Environmental Science and Entomology). Unsurprisingly, this overachiever’s multifaceted talents touch ever corner of her life, including the space she’s called home for the past 11 years. On the top floor of an unassuming Williamsburg building is a 1200-square-foot loft that’s been transformed into a veritable jungle with over 500 plants (and 150 species) and a handful of exotic insects, including African millipedes and Madagascar hissing cockroaches (they’re confined to a terrarium, if you’re wondering). While her home at first glance appears to be dominated by plants, Summer’s space is also decorated with dreamy touches, carefully curated vignettes, and furniture she’s built with her father using wood found on the street. Ahead Summer takes us through her unique loft and gives us some insight into the work she’s done, her perspective on her changing neighborhood, as well as some tips for raising plants in the city. Our ongoing series “My sqft” checks out the homes of 6sqft’s friends, family and fellow New Yorkers across all the boroughs. 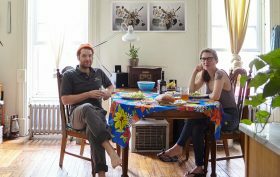 Our latest interior adventure brings us to the Bushwick apartment of Adam and Cami, a couple who spent the last few years living minimally abroad. Want to see your home featured here? Get in touch! Most of us moved to New York City with nothing more than a couple suitcases, only very slowly accumulating objects to fill our bedroom—definitely not thinking about tackling our living spaces. But here’s a couple that had no interest in sleeping on a mattress on a floor while they figured out how to decorate their home. 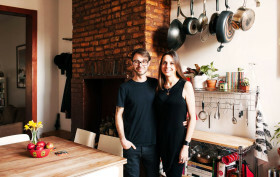 After spending several years in London and bouncing from friends’ places to sublets, Adam Dudd and Cami Raben (he’s a graphic designer and she works in hospitality consulting) moved into their Bushwick apartment wanting to create a home to call their own as soon as possible. While IKEA seems like the no-brainer quick-fix for those on a budget with any design sensibility, Adam and Cami weren’t interested in the mass-produced but instead wanted unique and quality pieces. So where did they turn without thousands of dollars to spend? Craigslist! 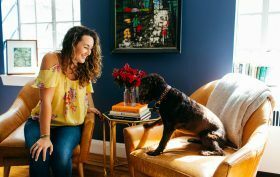 Believe it or not, in just four months the pair managed to turn a blank slate into a perfectly outfitted apartment that’s both minimal and functional and full of color and character. Our ongoing series “My sqft” checks out the homes of 6sqft’s friends, family and fellow New Yorkers across all the boroughs. Our latest interior adventure brings us to co-founder and creative director of DNA Dustin O’Neal’s Lower East Side apartment. Want to see your home featured here? Get in touch! Sage advice from the co-founder and creative director of DNA, a start-up consulting and PR firm representing some of New York’s top and up-and-coming architects and designers. While we know that cutting down your belongings is key to making a small space work, it’s not often that we see tiny apartments stray from an all-white color palette to include purple, patterns, lots of art and even pops of electric orange and neon yellow. 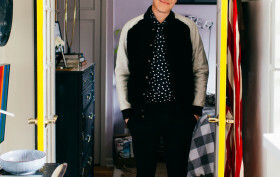 Having worked with dozens of creatives over the last few years, Dustin has picked up a thing or two about interior design, and his tiny 275-square-foot Lower East Side abode of three years reflects this knowledge. 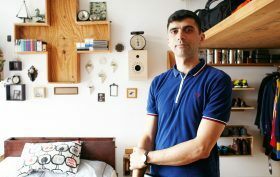 We recently visited the enterprising 26-year-old at home to see first-hand how you can transform even the smallest of apartments into a unique, style-filled space with less stuff.